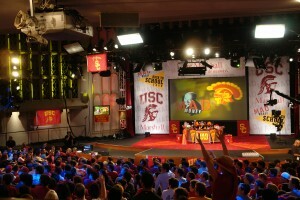 This form will allow you to request Bovard Auditorium at the University of Southern California. A venue production manager will be in contact with you regarding the status of your reservation request, cost, and paperwork details. Online reservation requests must be received at least 6 weeks in advance for Bovard Auditorium. Before you submit this form, please take a moment to view our staffing & rental rates. To inquire about general availability before submitting your request, please call the production desk at 213-740-4211. RESERVATION REQUESTS for 2018-2019: Bovard Auditorium is accepting reservation requests for the below semesters. If your requested date falls outside of this window, please submit the Event Early Booking Request Application found on our FAQ page or click HERE. Recognized USC Student Organizations – We are accepting reservations for Fall 2018 & Spring 2019 semester. USC Department & Non-USC Clients – We are accepting reservations for Fall 2018 semester only. For more information regarding our year round booking schedule, click HERE. All student organization events require a TES Co-sponsorship Form to be completed as per Trojan Event Services policy. Please note the additional requirements of TES as included on the form.